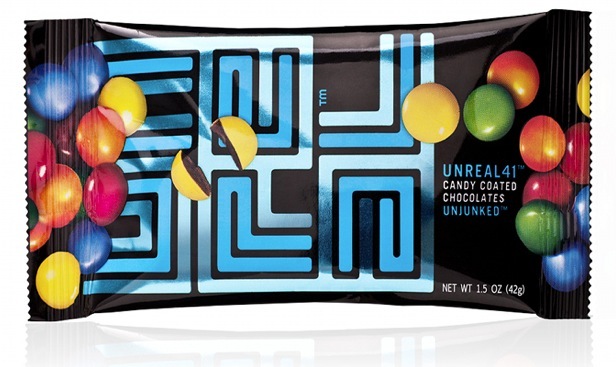 UNREAL candy is really quite good. I spied these at Staples of all places. There was a large display and I chose the m&m look alikes, called UNREAL 41. The packaging looks straight out of Tron. But, what the design lacks in refinement, the candy makes up for in taste. 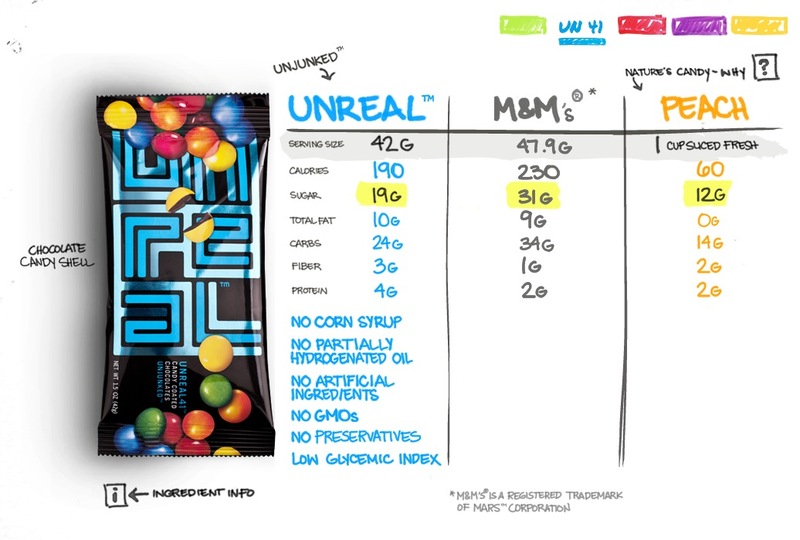 The candy claims to be “unjunked”, and reading the package you will see none of the following: corn syrup, partially hydrogenated oils, artificial ingredients, preservatives or GMOs. The candy shell coating came in pretty colors. Some of the colors, like yellow, seemed a bit light on coverage, but it didin’t affect the flavor at all. I have always wondered why factory-produced sweets need all of the mystery ingredients. When we bake, or make candy at home, we use pure ingredients. Why can’t the big candy companies do the same? Well, this company has set out to make candy that is free of all of the additives, and for that, I salute them. In the process, they’ve created a fan base and some excellent product. They have their story on their site here. Note the lower sugar content, and more protein (bonus!). I thought the chocolate flavor was very good, and I think I like them better than plain chocolate m&ms. I look forward to trying their other selections. My only suggestion is to re-think the packaging. It’s just too disco for me. Posted in Milk chocolate and tagged candy shell, food, mystery ingredients. Bookmark the permalink. These seem interesting, I’ll have to take a look next time, since I’m in Staples far more often than seems necessary. I don’t dislike the packaging, but it seems like the wrong packaging for what they’re going for. Those designs look like something you’d see in the SUPER CAFFEINE section of thinkgeek.com. I agree, the packaging and the product don’t match, but the candy is good. can’t wait to get my mits on them! been hearing all about them, exciting stuff! Let me know which ones you like the best. Thanks! Makes me wish there was a Staples around here!! 🙂 BUT I will be checking for more pure ingredients in my candy from now on. Thanks for the info!